Just Piano Stools for the widest choice of quality piano stools. UK postage is included in the price. These Tozer concert piano stools are available to order. Please allow up to six weeks for delivery. 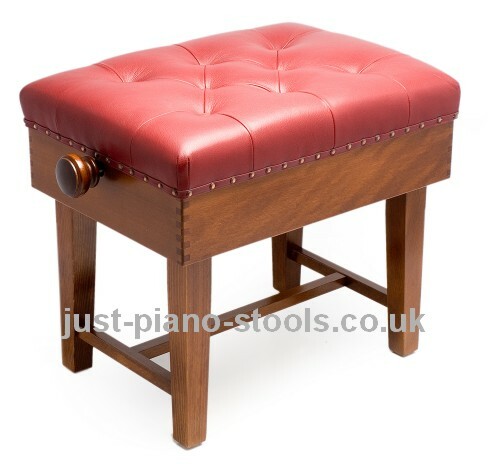 See our full range of piano stools. The Tozer 5028B solo concert piano stool features a deep buttoned leather seat, adjustable height with tapered legs. Available in satin or gloss finish. 54cm wide, 42cm deep and 48/58cm high. The Tozer 5028BD duet concert piano stool features a deep buttoned leather seat, adjustable height with tapered legs. Available in satin or gloss finish. 90cm wide, 42cm deep and 48/58cm high. Sorry we no longer supply Tozer stools. Tozer concert piano stools are available in solo and duet versions both with deep buttoned leather seats. 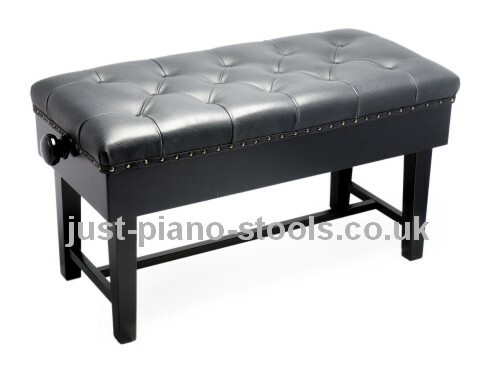 A similar concert piano stool is available from Woodhouse. The history H.J. Fletcher and Newman, owners of the Tozer brand, begins way back in 1876. H.J. Fletcher and Co. started by making fretted fronts for pianos, the company soon developed supplying the growing numbers of piano makers in London at the time. Morgan and Newman was founded in 1933 by Charles Newman and Fred Morgan. In 1958 these two companies merged to become H.J. Fletcher and Newman at the same time acquiring G.F. Baker and Co, and J.S. Tozer Ltd. They now had the facilities to supply piano retailers with a comprehensive range of products and services including piano components, piano stools and piano repairs. The British piano industry began to decline after the war so Fletcher and Newman decided to expand their piano services abroad reaching as far afield as Australia and the Far East. Today the Tozer brand is known around the world and the company has substantially increased its customer base in the UK and Europe. These concert piano stools are manufactured by Tozer and are made to order. Please allow six weeks for delivery of your new piano stool. These woodhouse concert piano stools are an alternative to the Tozer concert stools with a deep buttoned leather seat and Empire legs. View our piano stool range by brand.